When did you realize that a life of travel was meant for you? I’ve always liked traveling, but I only got inspired to take it seriously in 2011, after I started my travel blog. I had just come from a week-long trip to different provinces in the north of the Philippines, where I met and got inspired by several veteran travel bloggers. Before that, I was already writing for print media and newspapers, so I thought the blog would be a good outlet for stories and photos that didn’t see print. As a freelance writer, I frequently get (or choose) assignments that require travel. What’s great about my work is that I get paid to do what I love. When did you first learn to ride a motorcycle? Why did you choose this mode of transportation for travel? It was also in 2011 that I bought and learned how to drive a motorcycle. I used to ride pillion with my then-boyfriend (now husband) during the weekends. I saw that it was a great way to explore and decided to just buy a scooter and learn to drive on my own so I didn’t have to rely on him to drive. After a week of riding around the village, my first real test ride was in the Sierra Madre mountains and I’ve been hooked ever since. My scooter’s name is Chocobo, named after a creature from the Final Fantasy universe. Chocobos allow characters in the game to explore areas faster than if they go on foot, and access hard-to-reach areas. He’s been a great companion for weekend motorcycle rides and impromptu adventures but has started showing signs of aging lately. I’m currently saving up to upgrade to a bigger bike soon. How would you describe traveling around as a woman with a motorcycle? It’s very empowering to have complete control and the freedom to go wherever I want to go. In urban settings, I’m not bound by public transportation or traffic because I can weave past cars on the road. When exploring areas away from the metro during weekends or traveling by motorcycle in different provinces, I can just stop along the road whenever something catches my eye. Riding is something I can do alone. I don’t have to depend on anyone if I want to go somewhere. If the mood strikes, I can just drive off somewhere. What tips do you have for women who want to travel around with a motorcycle? A lot of people think that riding a motorcycle is dangerous. But these days, all activities have dangers. You could easily experience an accident going down the stairs or riding an airplane as well as driving a motorcycle. It always helps to have a companion when you ride, but sometime you just have to go solo. Just be aware of your surroundings. Don’t be afraid to ask for help when you need it. Wear proper safety gear. Don’t drink and drive! Of all the places you’ve traveled to in the Philippines, where is the one place that you would keep coming back to? Why is that? There’s this highway called Marilaque that traverses several towns and winds through the mountains. It’s my favorite weekend destination because I get a quick fix of open roads, twisties, and great natural landscapes like caves and waterfalls just a couple of hours away from where I live. No matter how many times I’ve driven through this road, I don’t get tired of it. Driving here cleanses all the cobwebs of city living. What is your most memorable experience while traveling around the Philippines? Motorcycling solo around Batanes, the northernmost island in the Philippines, was one of the best travel experiences I’ve had. Everywhere you look, the scenery was just postcard-perfect. Despite the small size of the main island, I consider this one of the most epic rides in terms of the raw landscapes and the warmth and hospitality of the people. Scooting around Siquijor, an island in the Visayas region that has a reputation for sorcery and witchcraft was also great. All of my misconceptions about the place were dispelled from my encounters with friendly locals and lovely natural attractions like waterfalls and beaches. Riding from Sagada, Bontoc and Banaue and back through the Cordillera mountains to visit the famed Rice Terraces, dubbed the “Eighth Wonder of the World” was pretty scary and amazing at the same time. What safety tips do you have for women traveling around the Philippines? Locals in the Philippines are generally very friendly and helpful to all tourists, particularly women. Just use your common sense. Be extra careful in the bigger cities and hubs like the capital Manila but the provinces are generally more laid-back and peaceful. What advice would you give women travelers around the world? You don’t have to travel far to exotic destinations to be a traveler. Sometimes, it’s a matter of seeing things in a different light. We tend to do the “touristy stuff” only when we are in a different place, but doing the same activities in your own locales could be a great way to explore. 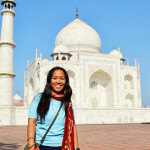 Learn more about Filipina Traveler Kara Santos on her blog, Travel Up. I was born and raised in Baguio City, Philippines. I am currently working and living in the country’s capital, Metro Manila. I love the simple things: a good book, the smell of freshly cut grass, good food. I love the grander things too: celebrations, adventures, traveling. I am currently taking the MatadorU travel writing course to further enhance my writing skills. I have published an article on Matador Network entitled 8 Signs You Were Born and Raised in the Philippines. You can find samples of my writing at Girl in the Metro.